If the GETSTARTED system variable is ON, the Welcome dialog box displays when you launch BricsCAD. Here you can choose the User Profile for the current session. You can choose between a number of Presets or user defined profiles. The most recently used profile is indicated by a blue frame. The very first time BricsCAD is launched the Get Started option is missing on the Welcome dialog. The Profile Presets page is shown instead. After selecting a profile preset the Get Started dialog displays with the new profile selected in the Set current profile list. Accept the currently selected profile or select a profile in the Set current profile list. 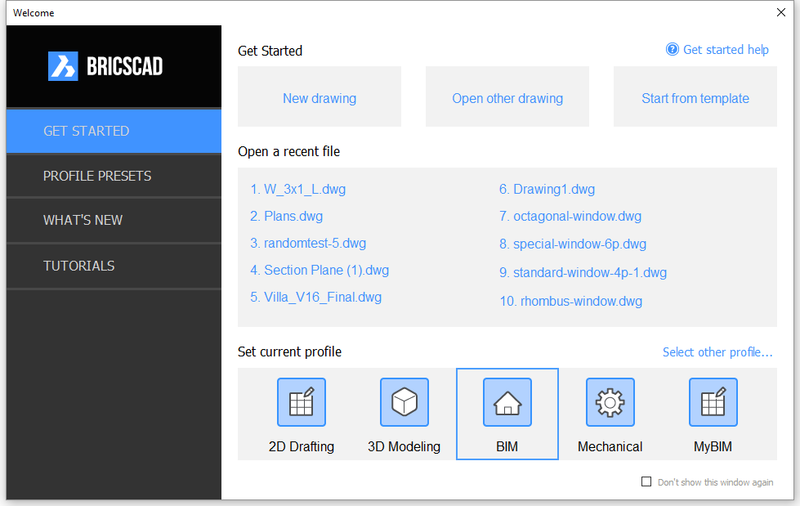 Click the New Drawing button to create a new drawing using the default template of the current profile. Click the Start from template button to create a new drawing using a template of your choice. Click the Open other drawing button to open an existing drawing. 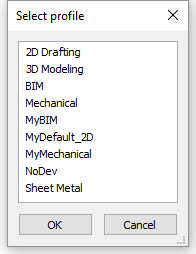 Click a drawing in the Open a recent file list. The number of files in this list is controlled through the Recent file list (NFILELIST) system variable. Up to 20 files can be listed here. Click a profile in the Set current profile list. By default the five most recently used profiles display. If necessary, drag the right hand edge of the Welcome dialog box to see more profiles. Click Select other profile..., then select a profile in the All profiles dialog and click the OK button. The selected profile is added to the Set current profile list. 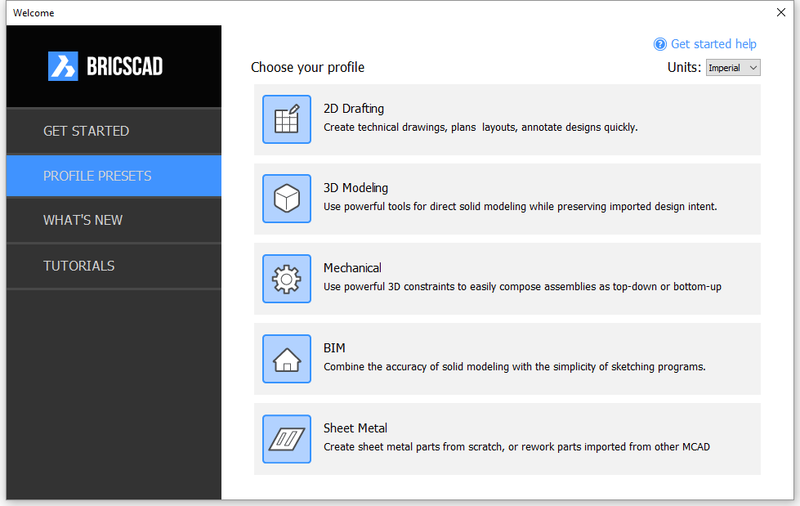 BricsCAD comes with a set of built-in hard coded profiles. You can use these Preset Profiles as templates to create your own set of user profiles. Each of the profile presets has the name of the Workspace they use. Click PROFILE PRESETS on the Welcome dialog box. Choose either Imperial or Metric in the Units list button to set the MEASUREMENT system variable in the profile. Select a Profile Preset, e.g. 2D Drafting. 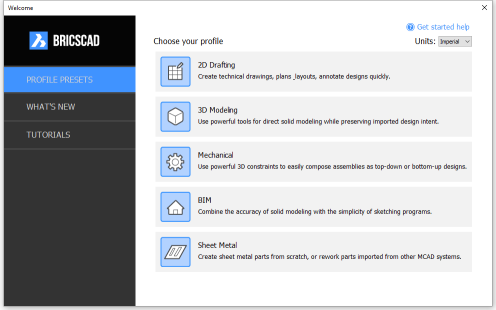 Type a new name in the Profile name field to create a new profile using the hard-coded settings of the selected Profile Preset. If you type the name of an existing profile a dialog box prompts you to confirm to overwrite the existing profile using the hard-coded settings of the selected Profile Preset. The Get Started dialog displays with the new profile selected in the Set current profile list.